Powers Traps angels and archangels. It's a Ma'lak Box. Secured and warded. Once inside... nothing gets out, not even an archangel. Especially an archangel. 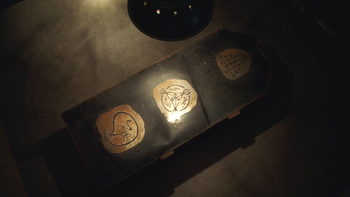 A Ma'lak Box is a specially warded container designed to trap and hold angels, including archangels. While there is lore on the Ma'lak Box, they are apparently impossible to build without the proper instructions and warding magic. After receiving instructions from Billie, Dean heads to Hibbing, Minnesota, to visit with Mary at Donna's cabin and to build the Ma'lak Box. When Mary finds out what Dean has built in Donna's shed, she warns him that if he doesn't tell Sam she will and that all three will talk about what he is doing. With Mary's ultimatum in place, Dean decides to tell Sam himself, bringing him to Donna's shed where he reveals the Ma'lak Box to Sam. Sam is at first surprised, having believed that Ma'lak Boxes were impossible to build, before questioning Dean's intent to be buried alive with Michael for eternity. 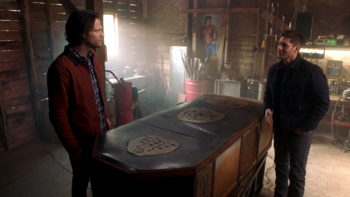 Dean corrects Sam, and tells him being buried alive is not safe enough; he plans to pay hush money to charter a boat and have the box dumped in the middle of the Pacific ocean. Dean reveals the Ma'lak Box to Sam. Sam's anger that Dean would do this and leave without telling him leads Dean to reveal to Sam that he is the only one that could talk him out of it. Steadfast in his resolve, Dean tells Sam he can either help him or let him do it alone. Begrudgingly, Sam shakes his head and tells Dean "Alright." Dean has a nightmare of what it will be like for him in the Ma'lak Box at the bottom of the ocean; as his phone eventually dies he is left in complete darkness screaming for "Sammy". He wakes to find his finger nails broken and bloody from scratching at the wall near his bed. Towing the Mal'ak Box in a trailer behind the Impala, Sam and Dean continue their journey to the west coast to go through with Dean's plan, but they start working a case involving Tony Alvarez, the prophet next in line after Donatello Redfield. Throughout the episode, they continue towing the Ma'lak Box. After Sam persuades Dean to renege on his plan, Dean tells Sam to trap Michael when the time comes if they cannot find another way to get rid of him. As Dean continues to struggle to hold Michael captive, he warns Castiel that they might get to the point where they have to implement his plan with the Ma'lak Box. Later, after escaping from Dean's mind and taking Rowena as his vessel, Michael displays knowledge of the plan and taunts Dean for not using the box when he had the chance. Dean declares that they can still do it and orders Sam to get the handcuffs, but Michael disables the Winchesters and Castiel and begins torturing them. Dean's plan with the Ma'lak Box is put to rest once and for all when Jack Kline kills Michael, ending the need to trap him. After Jack burns off his soul to kill Michael, he becomes dangerous, accidentally killing Mary. He then is duped by Dumah into helping her solidify her power in Heaven, killing unbelievers and creating new angels at her direction. Dean proposes to Sam that the only way to stop Jack is to lock him in the Ma'lak Box. Sam reluctantly agrees and prays to Jack, pretending they have found a way to restore his soul and that they just want to put Jack in the box temporarily to keep him safe. Jack returns to the Bunker and takes the Winchesters at their word, entering the Box voluntarily. Once in the Box, Jack's dark side (Jackifer) makes him realize the Winchesters don't have a plan to fix him and intend to hold him prisoner. He uses his powers to blast the box apart and escape. Ma'lak is the Semitic word for "angel." This page was last edited on 23 April 2019, at 06:56.